Usually by the time 6pm roles around on a Monday night, I am not in the mood to think about dinner - let alone actually cook dinner. I think this is why BD and I got into having Monday night as “slow cooker” night. Yesterday I was in the mood for some food comfort and I had not made this dish in quite some time. I came up with the idea a couple of years back and it’s one of BD’s favorites that I make. I’m naming it Italian Flag Pasta because you have all the colors of the Italy’s flag and of course – it’s Italian! *This recipe serves maybe 4…??? Let’s just say that we had about double leftover after we were done. 1 -Take the sausage and remove the casing. You can do this by making a very small incision along the sausage and slowly peeling it back. I remove the casing because if left on while browning, it won’t retain the shape that I want. 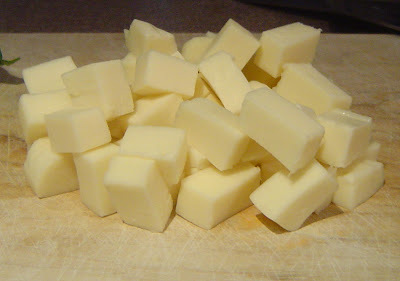 Then pop them into the freezer for about 15 minutes. This will allow them to harden slightly and it will be easier to slice into ¼ discs. Then in a large sauté pan, over med-high heat, add a little EVOO to coat the bottom of the pan and brown the sausage on both sides. Once I get them all in the pan and in a single layer, I add a little salt and some pepper. When the sausage is browned on both sides, remove from the pan. 2 - While that is browning, slice your veggies, basil and cheese. *Basil you can either tear, chop or chiffonade. I prefer the chiffonade because it’s prettier. It’s very simple to do: just layer the leaves on top of each other; roll into a little cigar; and then slice. 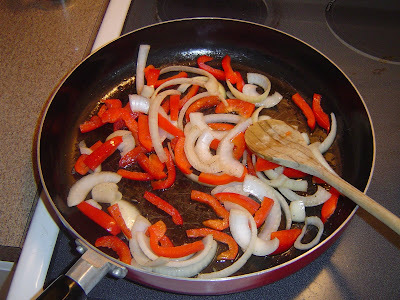 3 – Add some EVOO to a sauté pan and add your onion and peppers. Add S&P and sauté until soft. Takes about 10-15 minutes. 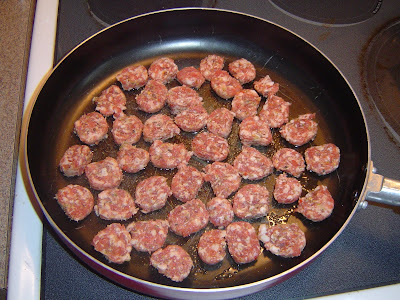 4- Once soft, add the sausage back into the pan and add tomato sauce. I used Hannaford’s Roasted Garlic tomato sauce. It’s probably one of the few jarred sauces that I will use because the flavor is really great. You can use any you prefer or even your own homemade. FYI: Hannaford is Sweet Bay’s private label. 5- Sauté everything together until sauce is heated through. 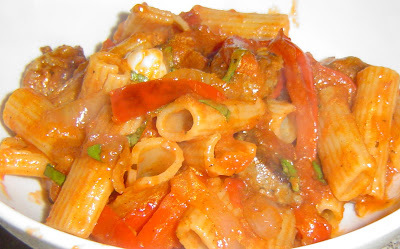 6- Once the sauce is hot and the pasta done, add the pasta to a large bowl, the sauce with veggies and sausage and stir together. Then add your mozzarella cheese and basil and toss. My thoughts on this dish: This dish always full of flavor and so easy to make. It's a great go-to for me, a good crowd pleaser, and feeds your soul. Wow, that was corny! My favorite part of this dish is how the cheese melts just enough to be soft and gooey. I also love the contrast of texture between the cheese and the browned sausage that retains a bit of a crust from the pan. And the fresh basil really gives it a nice burst of freshness. I'm usually not too picky with fresh or dried herbs, but with this dish its fresh basil or none at all, in my opinion.